Farhang Bidram has more than 20 years of experience in robotics business development and management. 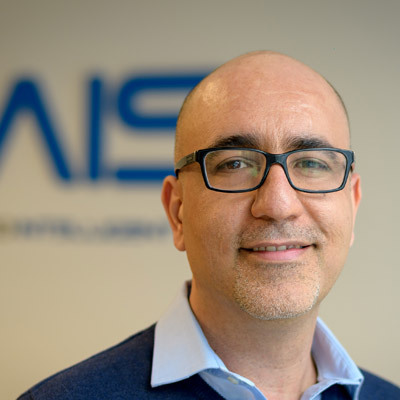 He founded Advanced Intelligent Systems in 2013 with Robert Vahedi (Chief Operating Officer), with the vision to provide a practical robotics solution for companies needing to automate repetitive and dangerous tasks. A robotics entrepreneur, Farhang has both the passion and the talent to develop new robotics ideas to improve efficiency and safety in industrial and agricultural applications. He applied the passion of mixing Robotics and Artificial Intelligence (AI) with years of experience to develop AIS’s flagship autonomous custom robot – BigTop. BigTop was designed to solve the repetitive and laborious task of moving and spacing pots within nurseries, and now Farhang is focused on taking AIS’s robotics solutions to the next level by empowering AI. Prior to AIS, Farhang was Founder and CEO of Hooshmand Sanat Espadan Ltd., an industrial automation company specializing in designing and manufacturing industrial automation solutions, specifically robotic. He has implemented 70+ industrial robots arms to automate several manufacturing facilities with different applications such as machine tending, welding, cutting and painting. Today, Farhang continues to develop new robotics ideas to improve efficiency and safety in various industries and has been instrumental in the company’s filing of more than 23 patents to date. © 2019 Advanced Intelligent Systems.